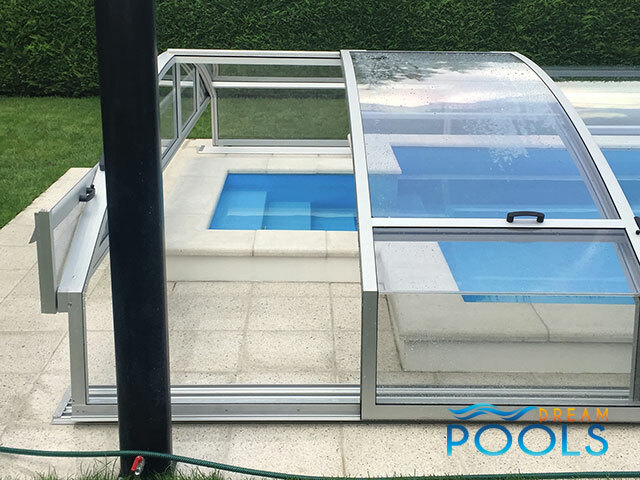 Our pool enclosures were especially designed not only to protect the garden pool, but they also add more charm to each fiberglass pool, thus making a magical place in your garden. 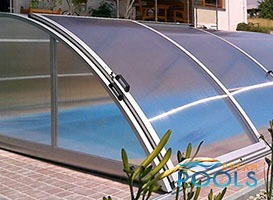 Pool enclosure Elegance – as the name suggests – is primarily a chic and elegance. 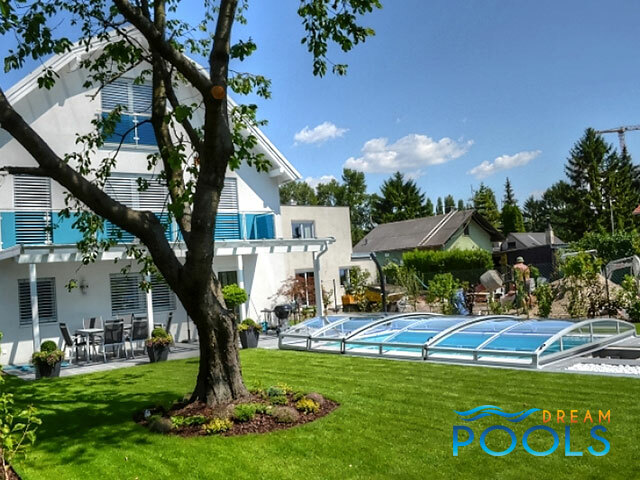 Wide front entrance provides easy access to your garden pool. 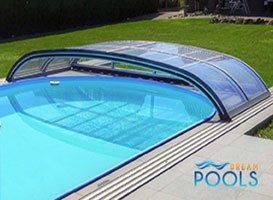 The flat rails provide ease of installation, smooth sliding and spreading pool roof. 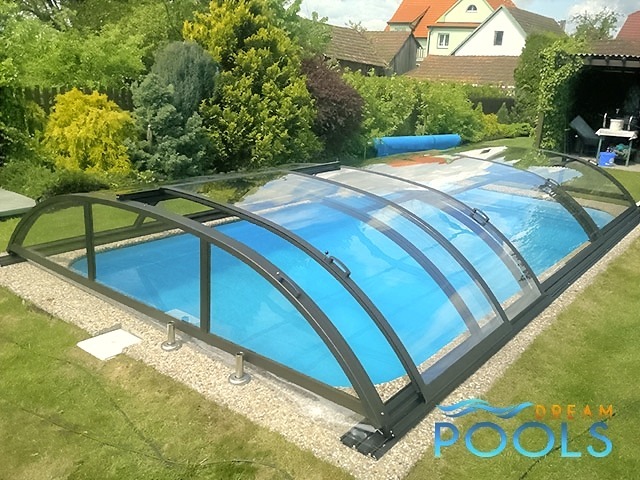 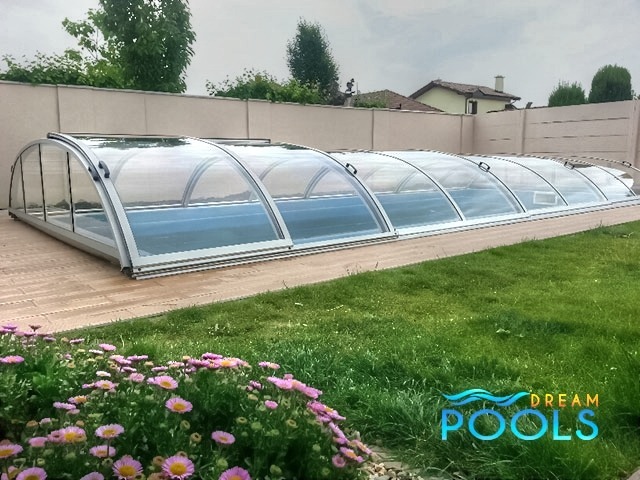 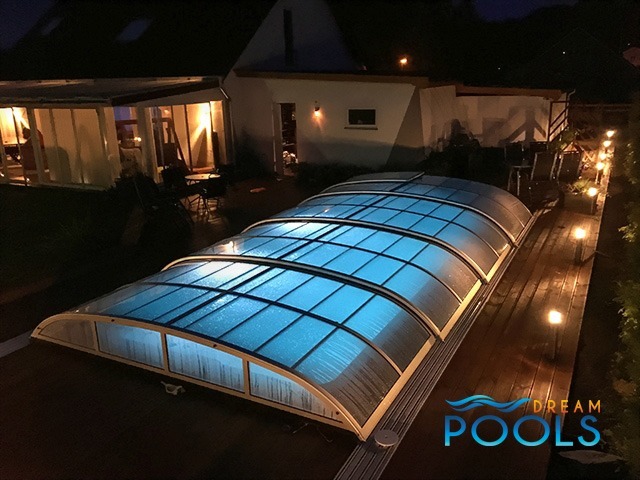 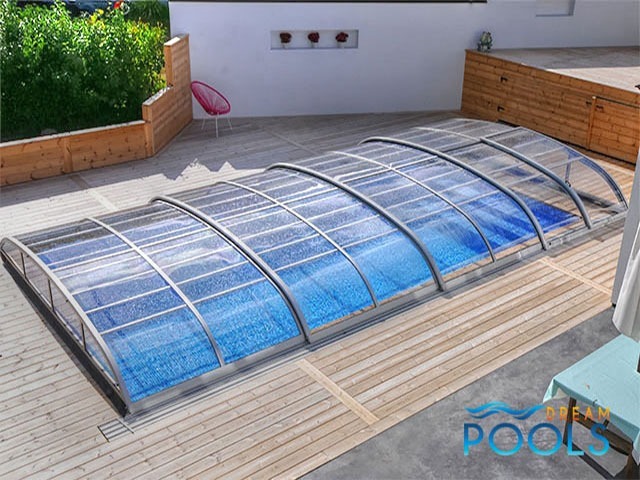 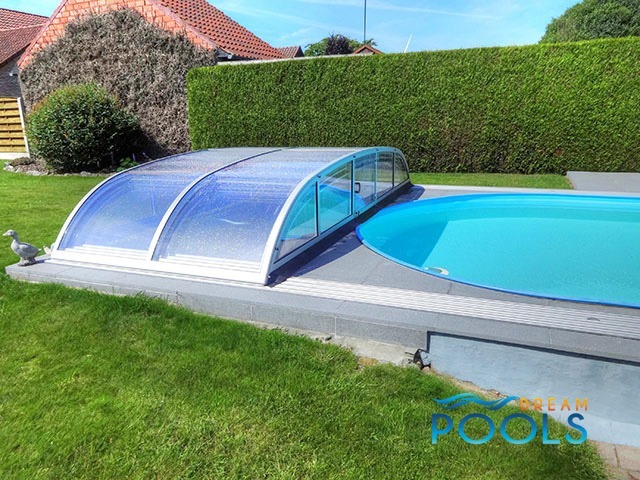 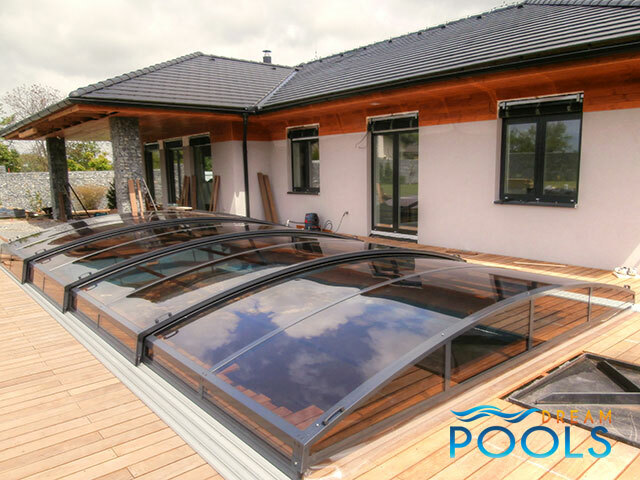 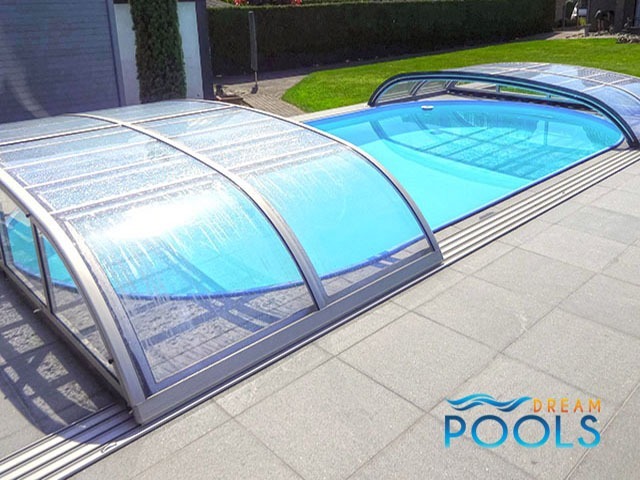 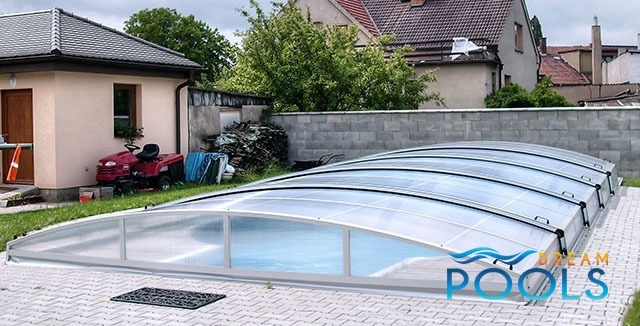 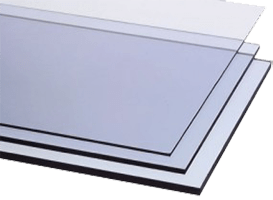 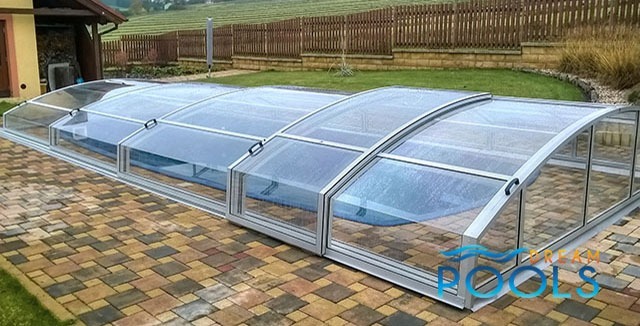 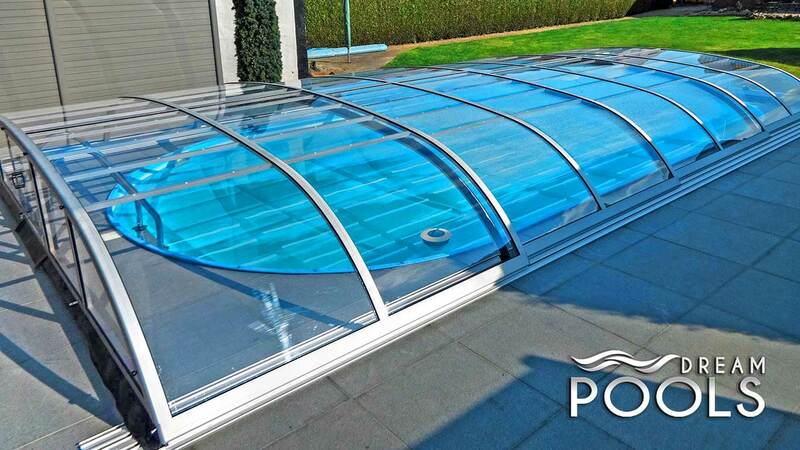 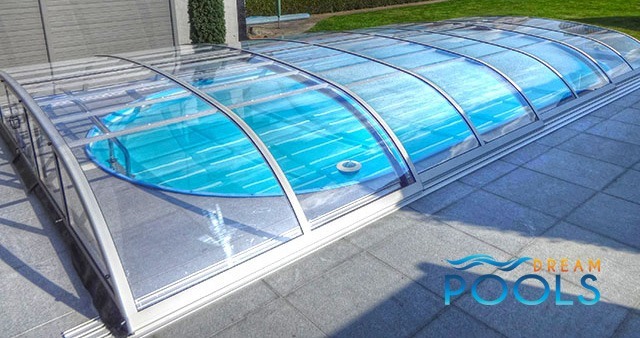 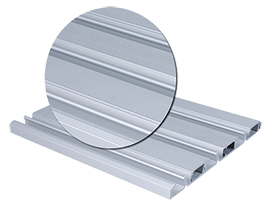 The combination of aluminum profiles and polycarbonate sheets that are completely transparent, ensures high quality, durability and make the pool cover along with a polyester swimming pool are a beautiful composition. 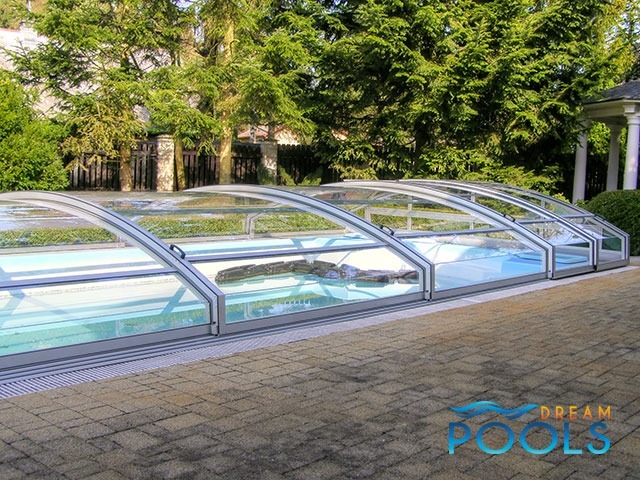 Optional additional extension rails allow smooth shifting the entire pool enclosure outside the polyester pool, providing a free accsess to it. In designing of pool enclosures Elegance+ we went a step further to provide our customers with a full convenience. 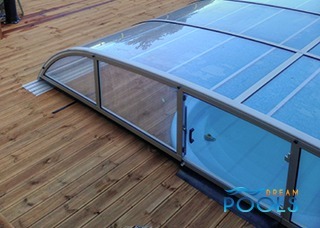 We used a side entrance to further facilitate access to the covered fiberglass swimming pool. 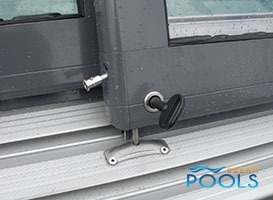 Doors can also be locked by a key. 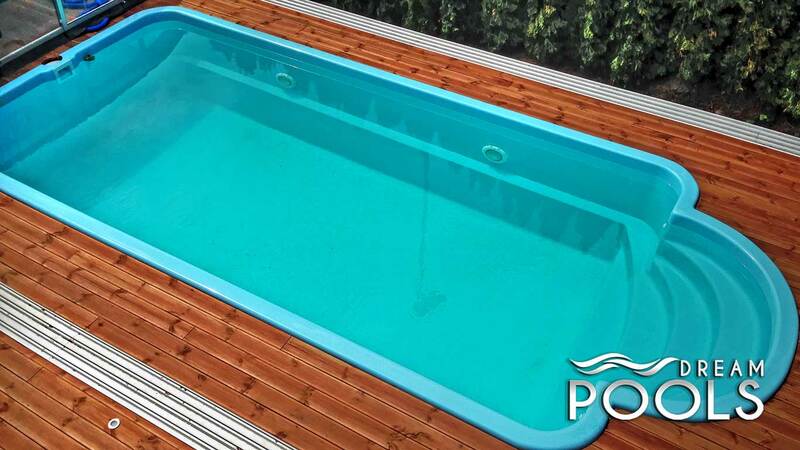 We have added extended rails as standard to provide you with more flexibility in using of the polyester pool. 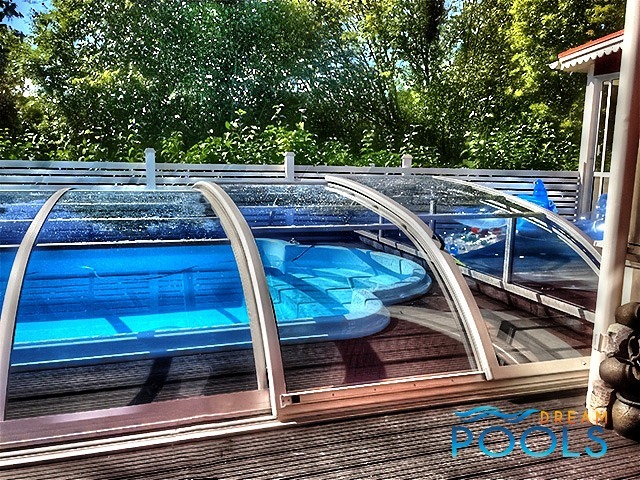 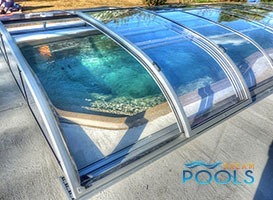 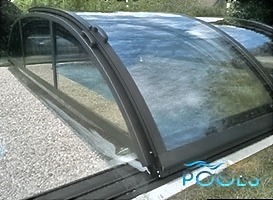 Increased number of sizes allows you to adjust the appropriate pool enclosure to almost every model of a garden pool. 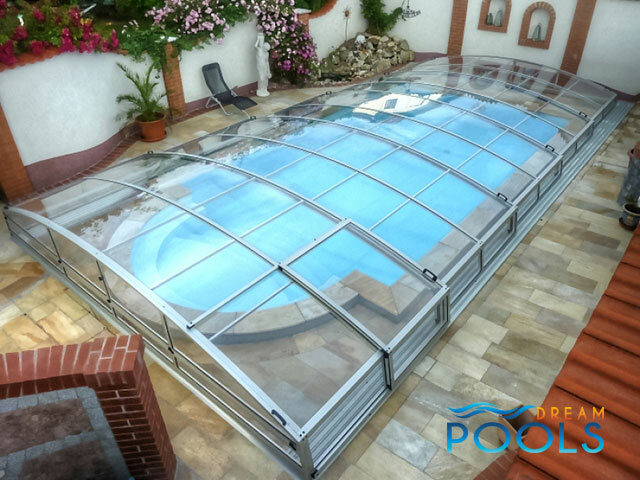 Style is timeless, low pool enclosure made from the highest quality materials to ensure the perfect protection for the fiberglass pool and the ease of opening and closing. 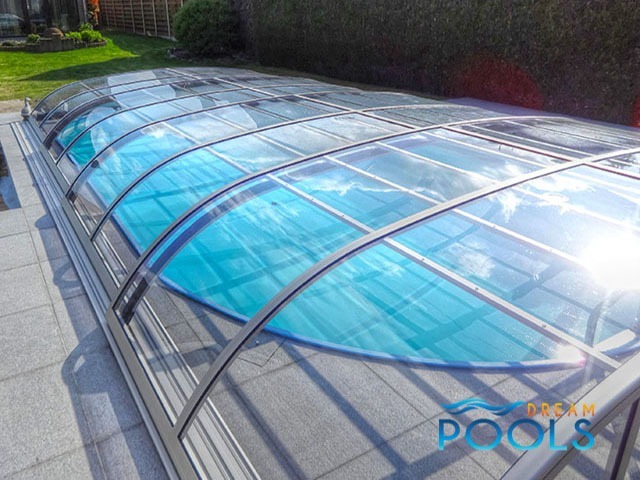 A wide range of sizes, accessories and ease of installation by providing encosure in the finished sections makes it the ideal solution for your garden swimming pool. 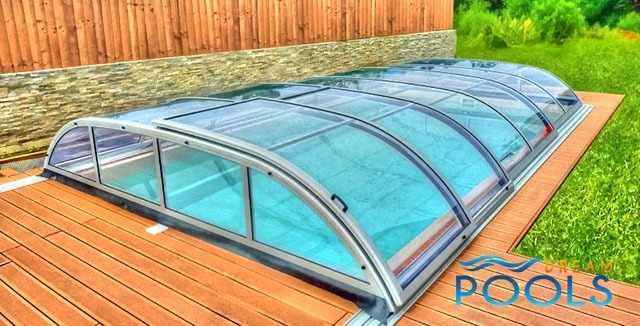 Prestige is a low pool enclosure next to which you can not pass both. 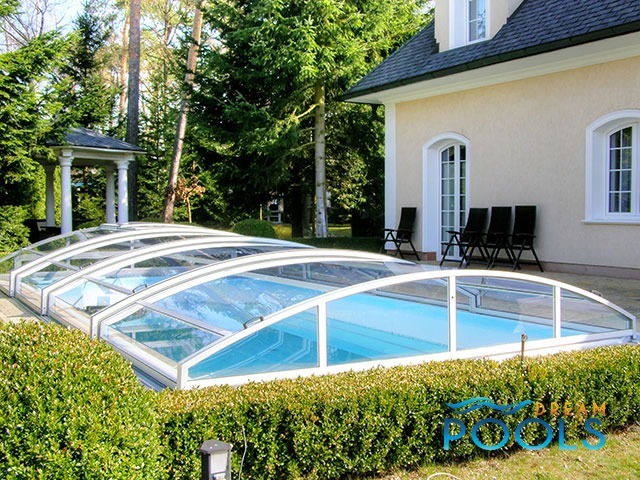 It is the quintessential combination of class and elegance with the latest trends in architecture. 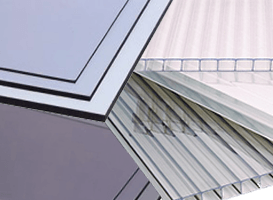  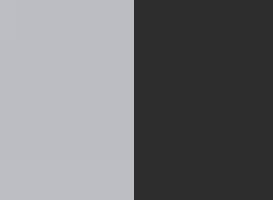 Its characteristic sharp lines and the collapse of eye-catching. 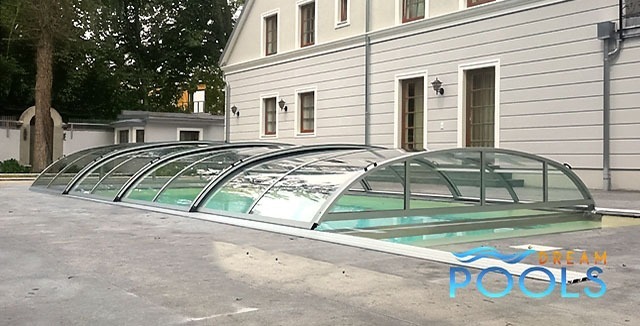 This pool enclosure fits perfectly with modern residential buildings and is their undoubted embellishment. 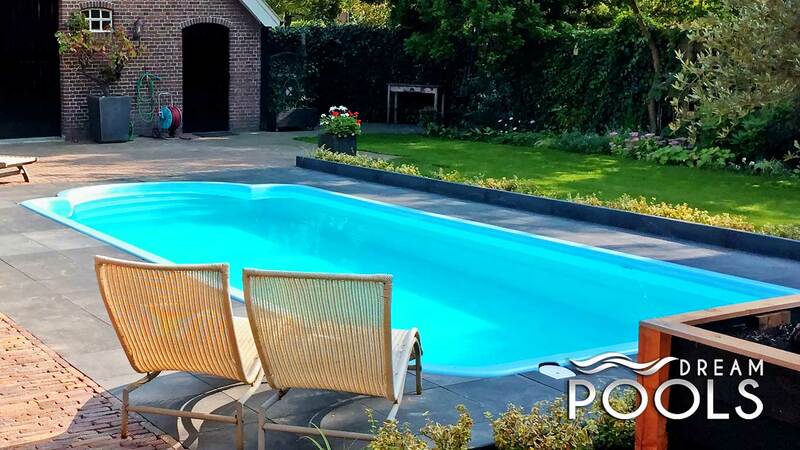 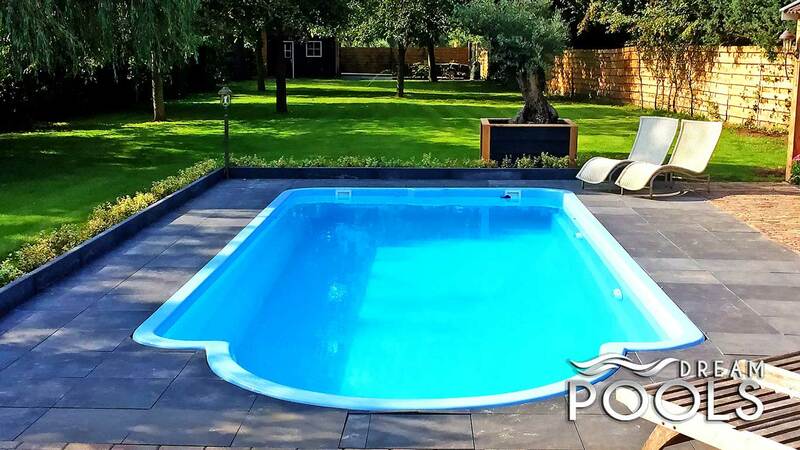 A wide range of sizes make the cover adapted to almost any type and size of the polyester pool.